As you might already know, we provide many connectors to IoT devices and APIs on the market. These connectors are available in our public GitHub repository. If you are not yet familiar with scriptr.io, you might be interested in reading this short tutorial that explains how to import scripts from a Github repo into your scriptr.io account. In order to import script.io scripts from GitHub to your workspace, you need to connect to GitHub as scriptrdotio. From the the scriptr.io workspace, click on your username (top left corner of the screen) then click on settings. 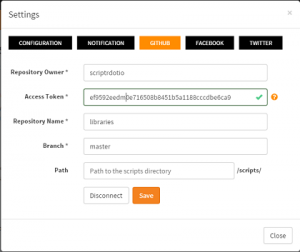 This opens a form where you can configure your connection to the scriptrdotio GitHub account. 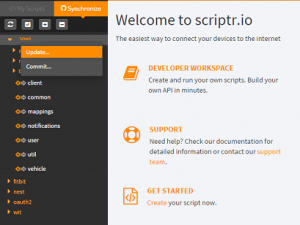 You should see the whole list of scriptr.io libraries added to the Synchronize area on the left side of the screen. In order to check-out a library into your workspace (in the remainder we’ll consider the “vinli” library as an example), right-click on every desired file of the vinli folder then on Update (see below screenshot). Check that the vinli library is now in your workspace by clicking on the My scripts tab. The scripts should appear in the vinli folder. Last, you need to modify the GitHub settings in order to point to your own GitHub account. Head to the scriptr.io’s GitHub settings and replace the owner name with your own GitHub username, and replace the repository name with the name of one of your repositories. This will allow you to commit the vinli code into your own repository (if needed).